Royal Deeside’ they call it, and the sepia traffic signs in and around the small Aberdeenshire town of Ballater bear a silhouette of Queen Victoria’s head to guide those intent on exploring a part of Scotland that has had royal connections since 1848, when Prince Albert first took the lease on the 50,000-acre Balmoral estate. In 1852, the freehold was secured and the smaller residence of Birkhall was gifted to Edward, Prince of Wales. He visited it only once-preferring the more spacious accommodation to be found at nearby Abergeldie Castle-and in 1884, Queen Victoria bought back Birkhall for the accommodation of other members of her family and staff. It was in the 1930s that George V lent Birkhall to the members of the family with whom it would become most associated: the Duke and Duchess of York, who redecorated the house and replanted the gardens. Both were keen gardeners, the Duke being never happier than when clearing up woodland and relishing the physical work it involved. The young Princesses Elizabeth and Margaret Rose spent many happy holidays here until, on the Duke’s accession as George VI, the King and Queen occupied Balmoral and Princess Elizabeth, Prince Philip and their own children stayed at Birkhall during the late summer months. It was after the King’s death in 1952 when The Queen Mother began, once more, to use Birkhall as a summer residence, that the small 18th-century house, dating from 1715, was enlarged and the plans that had been made by her and the Duke of York for the garden during the 1930s were brought to fruition. 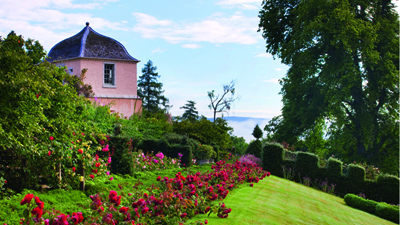 On The Queen Mother’s death in 2002, Birkhall passed to her grandson, Charles, Prince of Wales and Duke of Rothesay, and although the garden today bears many of his hallmarks, at its heart is the spirit of a native Scot who loved this part of the world and who felt, for Birkhall, a particular affection. ‘It is,’ says Prince Charles, ‘such a special place, particularly because it was made by my grandmother. It is a childhood garden, and all I’ve done, really, is enhance it a bit.’ Comparing photographs with those taken of the garden during The Queen Mother’s tenure prove the statement to be typically modest. Birkhall is 600ft above sea level and occupies a south-facing slope with the towering mountain of Lochnagar in the far distance. It’s not a large garden, and at its heart is the River Muick, a lively tributary of the Dee, which joins its parent river a mile to the north-east just outside Ballater. Stand in front of the house-a neat, L-shaped, harlcoated building the colour of double cream -and the garden falls away in front of you, to be embraced by the surrounding woodland. The overwhelming feeling is of seclusion. The sound of the Muick fills the air, wherever you wander, embroidered, in summer, with the screaming of swifts overhead. ‘The river is the magic,’ His Royal Highness says, and the amber water, frothing as it gushes around smooth boulders and the occasional bleached fallen bough, hurries on hastily towards the Dee. Not surprisingly, the garden at Birkhall is cultivated to be at its peak during the late summer months when The Prince likes to visit most. Ann Bain and Suzie Graham, the gardeners, admit, with some embarrassment, that they didn’t start out as gardeners but as horse loggers. Keen for a career change, they became additional gardeners at Birkhall one day a week eight years ago. When the previous head gardener left, they took on the job full-time and, with guidance from the Prince’s Head Gardener at Highgrove, Debs Goodenough, have maintained the gardens at Birkhall in fine order ever since. The terrace at the top of the garden is something of a suntrap and has been made ‘a bit more interesting’ by The Prince of Wales-a thyme-studded path now leads from the drawing-room windows and a ribbon of lady’s mantle (Alchemilla mollis) edges the flower-filled borders that run beside the house. The plant is subjected to ‘the Chelsea chop’ in late May to delay its flowering, the foliage being scissored off at ground level with shears A Leyland cypress hedge that once acted as a windbreak at the eastern end of the house has been replaced with a rough stone wall, which now ends in an elegant harlcoated gazebo, a memorial to the Queen Mother. The wall itself is topped with heather thatch; His Royal Highness’s eye for detail is everywhere apparent. Below the sloping lawn, the garden falls away rapidly, first to a terrace backed by a stone wall on which are trained espaliered fruit trees, and fronted by borders filled with red roses: Europeana, Le Mans and Bishop Elphinstone. The orange-and-yellow roses that once grew here are gradually being replaced as their colour is favoured by neither The Prince nor The Duchess of Cornwall. On the grassy slope below this terrace, to either side of the central steps that lead down into the main part of the garden, are two sets of initials delineated in clipped box: ‘ER’ for Elizabeth Regina and ‘CP’ for Charles Princeps-an affectionate tribute to the previous incumbent from the present one. The wide apron of garden below the terrace is in the shape of a bell and is even referred to as the Bell Garden. As with the distinctive terracing, the Bell Garden was designed, reputedly, by Sir Dighton Probyn, Keeper of the Privy Purse to Edward VII and then Comptroller to Queen Alexandra until his death in 1924. It’s divided up into a series of beds and is, in effect, a formal kitchen garden, but is planted up in an unpretentious style with, at its centre, twin borders flanking the bisecting gravel path. Within these borders, The Queen Mother planted the bright pink Phlox Windsor; the Prince has replaced these with a striking mixture of purple and pink clary -Salvia horminum-planted out in late May each year and forming a magic carpet by July and on through the summer. The effect is breathtaking and complemented by the central finials of clipped yew- the central one dating back to The Queen Mother and others, throughout the garden, strategically placed by His Royal Highness to offer winter structure. Willow-wand hurdles, 1ft high, retain smaller rectangular beds, replete with peas and beans, spinach and fennel, potatoes and fraises des bois, dahlias and sweet peas, beetroot and turnips, Sweet Williams and raspberries. Fruit, vegetables and flowers grow here in profusion with the aim of supplying the house during royal residence. Where practical, anything not supplied to the kitchen from the garden is brought from Highgrove. Sedum Autumn Joy lines the beds and is a magnet for bees in this organic garden, where runner ducks toddle from their pond at the bottom of the garden to help with slug control. Blue delphiniums are planted out in late May, along with the dahlias. They’re a favourite of The Duchess, who uses them in flower arrangements for the house. Other borders are planted with cosmos and more roses, and the broad, curving border, backed by the garden’s curving beech hedge, is a dense combination of Telekia speciosa (a yellow daisy native to the mountains of southern Europe) and our own rosebay willowherb- a striking mixture of gold and shocking pink. Just a few yards from a towering lime tree (under whose branches in 1856 Florence Nightingale, a house guest, was greeted by an admiring Queen Victoria) is an enclosed lawn at whose end sits the heather-thatched Wendy house built for Princesses Elizabeth and Margaret Rose and used by all subsequent royal children. The red squirrels, the secret pathways, the ducks and the tiny strawberries, so pickable at the path’s edge, are reminders that this is a family garden. ‘It’s crucial to keep places that link generations,’ says Prince Charles, ‘or we simply lose touch.’ No garden ever stands still, and the one at Birkhall is being added to and, in The Prince’s words, ‘enhanced’ each year. Fond of his ‘stumpery’ at Highgrove, he’s created another to the west of the house at Birkhall, reached by passing under a series of woven wire arches upon which he’s fastened locally collected antlers. Here, hostas, gunneras and an assortment of ferns enjoy the damp atmosphere and muck-enriched earth beneath the canopy of overhanging trees. Beyond the stumpery, a bridge made out of a dead elm tree from Balmoral by two Prince’s Trust-supported entrepreneurs leads to an island in the River Muick. Until six years ago, nothing other than a mass of shrubby spiraea grew here. 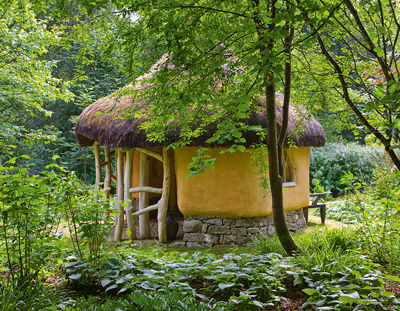 Now, a cob summer house sits at it centre-a 60th birthday gift-and woodland plants and shrubs carpet the ground. There have been, says Prince Charles, ‘endless disappointments’, but experience has shown that blue poppies, Meconopsis spp., thrive here, along with rugs of Primula florindae, brought from The Queen Mother’s far northern residence the Castle of Mey. They jostle for space with honeysuckle and hostas, Japanese maples and other woodlanders. The Prince is a dense planter; there is little or no bare earth on view. A bouncy wire bridge crosses the river at the bottom of the garden; built in 1880, it reinforces His Royal Highness’s claim that this is a garden to delight children. ‘You simply have to bounce on it,’ he says. At the moment, it leads to a bare field, soon to become an arboretum celebrating The Prince’s 65th birthday and to mark the birth of his grandson. It’s difficult to think of a better way of commemorating the efforts of a royal prince who has done so much for gardening and the landscape and whose passion in life has been to foster a greater responsibility for the natural world. 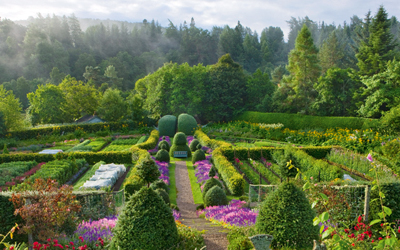 The garden at Birkhall demonstrates to perfection his beliefs, his love of gardens, of wildlife and the countryside and, equally important, of Scotland. It is a treasured family sanctuary that’s replete with fond memories, but it’s also a stepping stone for future generations of royal children-and grandchildren-who will come to love and cherish it as much as its current custodian. 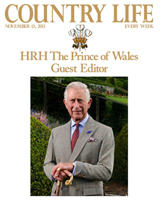 The Prince says: ‘My gardening style is to try to work with the spirit of the place and to have enough time to walk round and round until a vision of how it should be comes to me. Sometimes, I see it in a dream.